In this captivating blend of culinary history and popular culture, the award-winning author of Perfection Salad shows us what happened when the food industry elbowed its way into the kitchen after World War II, brandishing canned hamburgers, frozen baked beans, and instant piecrusts. 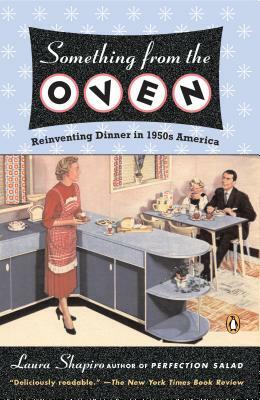 Big Business waged an all-out campaign to win the allegiance of American housewives, but most women were suspicious of the new foods—and the make-believe cooking they entailed. With sharp insight and good humor, Laura Shapiro shows how the ensuing battle helped shape the way we eat today, and how the clash in the kitchen reverberated elsewhere in the house as women struggled with marriage, work, and domesticity. This unconventional history overturns our notions about the ’50s and offers new thinking on some of its fascinating figures, including Poppy Cannon, Shirley Jackson, Julia Child, and Betty Friedan. Award-winning writer Laura Shapiro was at Newsweek for more than fifteen years. The author of Perfection Salad, she has written for many other publications, including The New York Times, Rolling Stone, Granta, and Gourmet.